Life is returning back to normal this week. After much excitement, I can say that all of the wheels are back in motion to make 2012 an even better year than last. I'm off to a good start! Creatively, I tend to work my best in the mornings. I typically can accomplish twice as much between the hours of 6 a.m. - 10 a.m. as I can the rest of the day. That is of course, assuming I'm not trying to get over last night's cocktails. Those mornings typically turn out less productive than I'd like. Otherwise, I tend to come up with most of my wild ideas while pounding the pavement on long runs around Nashville. Hey, to each his own, right? Anyways, I'm wanting to start this year off right by getting back to the basics, personally and creatively. Of course, I've advocated for a long time that starting the day off right begins with eating a healthy breakfast. Towards the end of last year, I wrote a post on "How to Make Better Eggs" for my pal Brett over at The Art of Manliness. Contrary to popular belief - most people don't know how to make great eggs. Yet . . . they want to know how. That post turned out to be one of my most popular posts in my series of Kitchen Fundamentals. So, in light of this month's upcoming posts, I've been pretty busy making omelets. I wanted to share one of my favorites that's not part of my AofM series coming out later this month. More importantly - it feels good to be back in the kitchen! Preheat a 10 inch non-stick skillet over medium high heat; add and melt butter. Add the turkey and slightly brown for 1 – 2 minutes. Meanwhile, whisk together eggs until frothy and combined and season liberally with salt and pepper, mix in sliced green onions. Add egg mixture to pan and cook undisturbed for 45 – 60 seconds. Using a wooden spoon or spatula, carefully lift the cooked portions from the bottom of the pan while tilting the pan to allow the runny portions to reach the hot surface. When the majority of the eggs have set, and with the top portion still moist, carefully flip the omelet over using a spatula - or score some bonus points - by using a quick back and forth motion, flip the omelet in the pan by using gravity and the lip of the pan (Note: you might want to do this over the sink on the first try). Assemble cheese on one side of the omelet and cook the underside for another 45 – 60 seconds. Finally, serve the omelet out of the pan, folding over the other side as you plate to melt the cheese and finish the presentation. Serve. Ingredients in the pan - Work and set the eggs another minute before flipping. Voila - breakfast is served. I like to add A LOT of green onions - sweet, mild, and delicious - not to mention color! Let us not forget a warm cup of Don Francisco's Hazelnut Coffee. It was nice to see Bon Appetit throw a little love towards my beloved city of Nashville today. In it's fantastic article, Black Key's Dan Auerbach reveals his favorite local haunts - highlighting everything foodie to meat and three. For those fans of Anthony Bourdain, it seems as though Auerbach has pulled a page out of his playbook. Riding alongside chefs to discover the food and drink that provide the pulse behind one of America's best music (and food) scenes. Visit here for full text, photos, and videos. It's just past midnight on Saturday, and I'm in the backseat of chef Tandy Wilson's Toyota pickup. Riding shotgun is Dan Auerbach, singer-guitarist for the Grammy-winning band the Black Keys. He's flipping through Wilson's CDs, nodding in approval at some, snickering at others. No one wants to have their music judged by a rock star any more than they'd want Tom Colicchio standing over them as they make omelets on a Sunday morning. Eventually, Auerbach settles on live Allman Brothers and talk turns to a more pressing issue: whether to order mild or medium-hot at our destination, the one-of-a-kind Prince's Hot Chicken in Nashville, Tennessee. As for how I wound up in a truck with a chef and a musician on the way to my third meal of the night, let me rewind. I'd visited Nashville a few times while growing up in Atlanta. Back then, it meant one thing to me: country music. I liked Nirvana, so I dismissed the place. 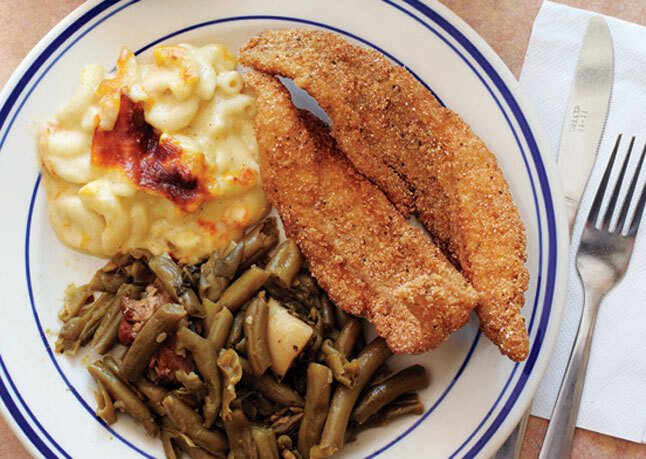 Then a year or so ago—boom—the Southern food revolution hit. Suddenly, New Yorkers were eating grits (and loving it). Critics were talking about biscuits and fried chicken like they were blinis and caviar. Nose-to-tail eating, canning, curing, bourbon—things that have been part of the South's culinary traditions for centuries—were now obsessed over from coast to coast. Being Southern and eating Southern were cool; the restaurants and ingredients down South are better than ever. And nowhere was this more apparent, I'd heard, than in Nashville. So when my friend Dan, who'd recently moved there, invited me down, I was on a plane a week later. "I gotta be honest," Auerbach says as we slurp tortilla soup at Mas Tacos Por Favor on my first day in town. "I moved here partly because of the food." That's not hard to believe. He's lived in Nashville for a year and already has opinions on everything from where to find the best pho to who makes a "proper" cortado. But it's not just food (and drink!) that's making Nashville the South's City of the Moment. IN my week on the ground, I felt the energy of a city in motion. I saw it in the faces of the staff at Imogene + Willie, a shop selling handmade clothes in a former gas station; smelled it in the smoked cacao-nib brittle made by Oliver & Sinclair Chocolate Co.; heard it at Auerbach's recording studio. And yes, I tasted it, in everything from Arnold's Country Kitchen fried chicken livers and collard greens (made with wasabi, by the way) to drinks poured with locally made Corsair Artisan spirits to that tortilla soup. A few minutes away, Wilson's culinary soul mate, Tyler Brown, runs the Capitol Grille (no affiliation with the steak-house chain) in the stately, 100-year-old Hermitage Hotel. Know in Nashville food circles as "TnT", Tandy and Tyler share a passion for Southern kitchen traditions while keeping their food modern and fresh. Brown is also an heirloom-ingredient junkie. He starts most days at the restaurant's 66-acre Glen Leven farm, just five miles from the hotel, picking vegetables for that day's menu. One morning I tag along, harvesting purple okra and sesame seeds. Brown's got beehives for honey, but most impressive his his herd of cattle, raised for the restaurant's exceptional burgers and steaks. The whole operation is proof that "farm to table" is more than a marketing slogan. Like most great food cities, Nashville nails both the high and the low ends. For lunch one day, Auerbach and I drive a half hour to Martin's Bar-B-Que Joint in Nolensville, where pitmaster and chef Patrick Martin pulls what locals call "redneck spaghetti," the long strands of meat from the belly of a 200-pound pig that's been cooked low and slow for 24 hours. No matter how you order it—on a slider, straight-up purist style, or on a cornbread pancake topped with sweet BBQ sauce and coleslaw (called a "redneck taco" on the menu)—it's barbecue so addictive that states should regulate it. A few hours later, I'm back downtown for dinner at the Catbird Seat, run by Benjamin Goldberg and chefs Erik Anderson and Josh Habiger. With its 20-seat chefs' counter, set menu, and technique-driven food, the endearingly earnest spot pulls off the kind of fine dining that you'd expect to find in New York or even Copenhagen. If you're lucky you'll be served a crispy piece of chili-dusted chicken skin as an amuse-bouche, their take on hot chicken. The food is 180 degrees from Patrick Martin's, but somehow it's part of the same movement—and the same moment. Back at Prince's, 15 minutes away, Auerbach, Wilson and I are sweating through a crispy bird fried with loads of cayenne, served with pickles and white bread to absorb the lip-tinging grease. Then we make our way to City House for a nightcap at 2:00 a.m. Wilson pours some rare Tennessee whiskey while Auerbach plays DJ. This time, it's the Grateful Dead. My stay in Nashville is coming to an end, but I know I'll be back soon. In my week here I've discovered a group of artisans rooted in Southern traditions, each tackling his or her thing—be it food, fashion, or music—in a fresh, inspiring way. I've seen a place that embodies New South cool, mixing country and city, high and low. And while I'm no rock star, with help from my friend Dan, I've certainly eaten like one. NOTE: This is probably one of those meals you don't want to serve on the first date. For most women, the thought of consuming med-rare wild game might be 'off-putting', so I don't suggest taking your chances. Instead, maybe serve her a roasted chicken breast, a sauteed shrimp, or a nice piece of fish. BUT: if you choose to be so bold and serve that lovely lady a slice of this Elk Steak, and she doesn't freak out . . . CAUTION: You've probably found "the one"
Ok, now that my legal team is satisfied with my disclosure, let's get to talking steak, and more importantly - Elk Steak. Fellow country music singer Easton Corbin bagged this beautiful animal in New Mexico, and I have been anticipating it hitting my grill for months. So, I was overjoyed when Chris Tate, (Easton's tour manager) had myself and Luke Bryan guitarist Michael Carter over for dinner. The catch? I had to cook. Fine by me. For those of you daunted by such wild game - don't be. I'm probably starting to sound like a broken record these days, but the secret is simplicity. We had two different steaks (tender roast) which is just off the backstrap or tenderloin. These cuts are most similar to a tri-tip roast that you would prepare on a cow. Wild game? Sure. Game-y? No. I heated my Lodge Cast Iron grill pan over medium high, and seasoned these cuts LIBERALLY with salt and pepper. A dash of oil, and balsamic vinegar adds a nice acidity and fruit to the meat. After that - on the grill. 4 minutes on each side. Remove from heat, tent with foil for 10 minutes. Slice thin and on the bias. Keep in mind that Elk is SUPER lean - so you want to serve medium rare (as pictured). If you over cook this meat, it will truly dry out and become tough. I'd say I'm starting 2012 off in the right direction! Snowing and 28 degrees here in Nashville today. Catching a plane to LA in a few hours - sunny and 80. Much needed. Cheers and happy MLK to all!